Anyone who’s ever needed roof repairs knows that the process can be messy, expensive, and time-consuming. Not so with Hi-Mark Roofing and Waterproofing. 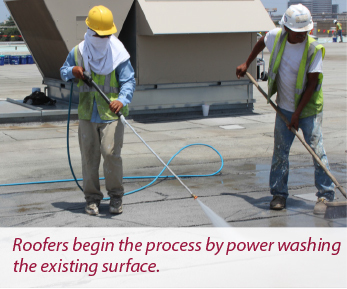 The company uses the Choice Partners cooperative purchasing contract to install a roofing system that keeps water out and energy bills low – all under tight deadlines and at a reasonable price. The beauty of the HydroStop roofing system that Hi-Mark installs, according to owner John Follis, lies in its simplicity. The work requires but a few simple tools – a brush, a hose, a pair of scissors and a paint roller. Hi-Mark’s customers are pleased with the company’s professional level of service and thrilled with the savings on energy costs. Curtis “Robbie” Robinson, Sheldon ISD maintenance coordinator, contracted Hi-Mark to install its product on top of a 50-year-old roof at Royalwood Elementary. Now, Hi-Mark is Sheldon ISD’s preferred applicator of the Hydrostop system, which has been approved by the school district’s board of trustees for use on all campuses. Robinson added that he’s satisfied with the seamless roof, which is self-cleaning, except for the drain lines. Other school districts that have used Hi-Mark’s contract have seen energy savings ranging between 10 and 20%. 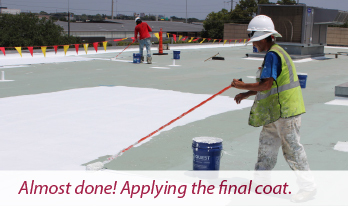 Hi-Mark’s contract for IDIQ roofing, waterproofing and moisture control—first approved by Harris County Department of Education’s (HCDE) board of directors in 2014—is a primary example of how Choice Partners contracts meet the gold standard in purchasing. When HCDE’s Westview Drive facility was in need of an update, Hi-Mark rose to the occasion. Hooper went on to say that energy efficiency and long-term durability were primary factors in the selection of Hi-Mark; its ability to complete the project in a short time frame made the choice a no-brainer. “Hi-Mark was able to easily accomplish what we needed more so than what conventional roofing would have,” he said. Last year, Hi-Mark installed roughly half a million square feet of roofing on schools. This year, the company is on track to double that. Follis credits cooperative purchasing with bringing simplicity and reliability to the government bidding process. “My company’s utilization of the purchasing cooperative is why it’s working great for schools,” he said. 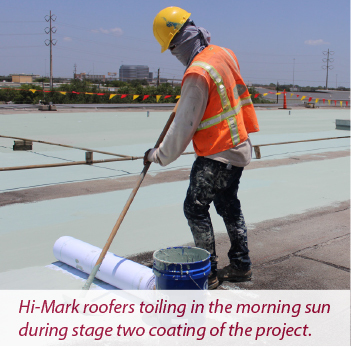 For more information about Hi-Mark, go to https://www.choicepartners.org/ vendors/hi-mark-roofing-and-waterproofing or contact owner John Follis at john@ hi-markroofing.com or 832-434-4170.